Releasing on October 13, the Day One Edition and Slime Collector’s Edition are Square Enix Store exclusives and will run you $59.99 and $99.99, respectively. Details are below. Slime Plushie, Slime Key Chain and Slime Lanyard. The original story follows after the trailer. If Square Enix was planning on announcing the release date for Dragon Quest Heroes: The World Tree’s Woe and the Blight Below at E3 2015, Best Buy has ruined the surprise. According to a leaked promotional display, the game will be released in October, and the official page for the game on the retailer’s website corroborates the date. 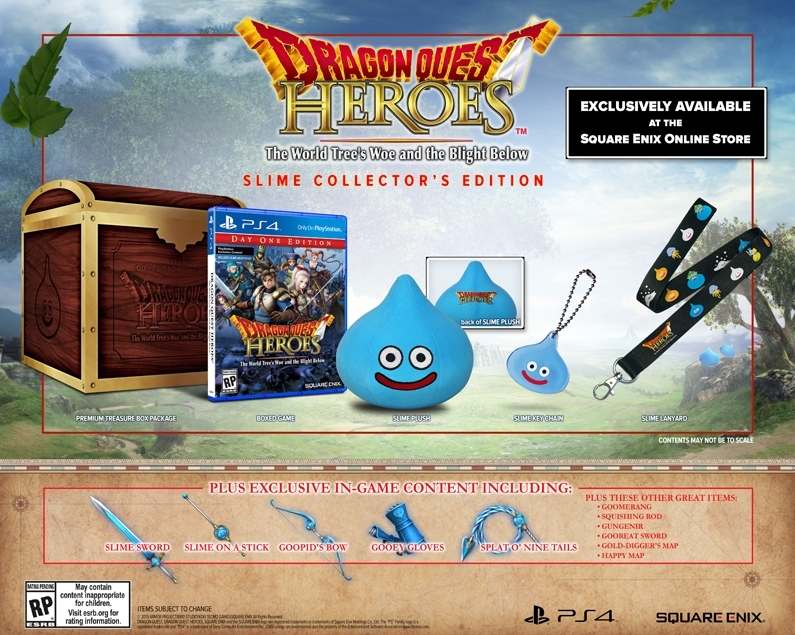 Those looking forward to Dragon Quest Heroes can pick it up for PlayStation 4 in North America on October 13. A European release date has yet to be announced.